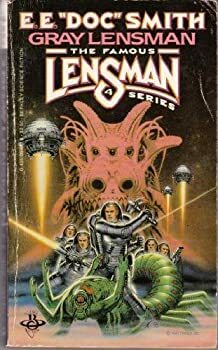 Although the events of Book 4 in E. E. “Doc” Smith’s famed LENSMAN series, Gray Lensman, pick up mere seconds after those of its predecessor, Galactic Patrol, this latest installment actually first appeared over 1 ½ years later. Whereas Galactic Patrol had initially appeared as a six-part serial in the September 1937 – February 1938 issues of Astounding magazine, Gray Lensman had its debut as a four-part serial (even though it is a longer story than that in Book 3) in Astounding’s October 1939 – January 1940 issues, the first two issues featuring beautiful cover artwork for the serial by famed illustrator Hubert Rogers. 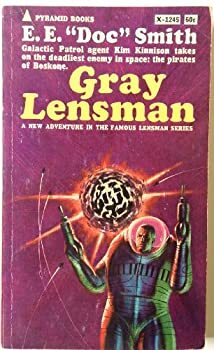 Gray Lensman was first published in book form in 1951 as a $3 hardcover from Fantasy Press, featuring still another minimalist cover from Ric Binkley, and like the other five books in this most famous of all space operas, has seen numerous incarnations since; this reader was fortunate enough to acquire the 1982 Berkley paperback, with beautiful cover art by David B. Maddingly. The book, as it turns out, is a wonderful sequel, expanding on the story line of Book 3 while introducing new characters, new planets, a fresh set of enemies, and the many titanic space battles that readers might be expecting at this point. After the destruction of Helmuth’s base, and the inadvertent obliteration of much of the planet, Kinnison makes a preliminary investigation of the nearby “second galaxy,” Lundmark’s Nebula, from which communications had been sent to Book 3’s archnemesis. While there, he and his crew of the Dauntless come to the aid of planet Medon, which is under attack by the so-called space pirates of Boskone, and later receive the welcome gift of advanced technology from that beleaguered world … including an apparatus that will enable an entire planet to travel at faster-than-light speeds! Using that remarkable machinery, Medon is moved into our own galaxy in record time, while Kinnison begins his new campaign. He has come to realize that although Boskone has been defeated militarily in our own galaxy, their threat remains a very real one, due to the insidious influx of drugs (particularly the hyperaddictive thionite, which had been dramatically showcased in Book 2, First Lensman). 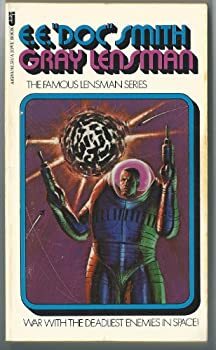 This Book 4 of the LENSMAN series, it should be added, ups the game of previous volumes as regards weapons of superscience and futuristic technology. Thus, besides that Negasphere (a vast circular nothingness of what one can only assume to be antimatter, and that is capable of gobbling whole planets) and the ability to transform abandoned/useless worlds into faster-than-light missiles of war (! ), Smith here gives us a vast improvement of the engineering and weaponry in the Patrol’s ships (courtesy of those superadvanced Medonians) and, thanks to Phillips the Posenian, a means of regenerating body parts. (You didn’t really think Kim was to remain a basket case for the duration of the series, did you?) Kinnison’s abilities have also been greatly improved in this installment, as he soon discovers that he is capable of mental marvels even when not wearing his Arisian Lens! And those newfound abilities sure do come in handy here, as he reads secret Boskonian files from a great distance, and communicates with a spider and a worm, on two different occasions, to give him some much-needed assists. For this reader, these books are elegantly written in the best Golden Age manner, and if the characterizations therein take a backseat to the plotting and world building (or, rather, galaxy building), as some have maintained, it is a pardonable offense. When I was reading as a teen, I loved stories with complicated plots. It meant I could sink all of my attention into the book. It sounds like I wasn’t alone. And it’s also possible that they (we?) didn’t really grasp all that complexity at the time. They certainly didn’t understand “yclept,” that’s for sure! Better have a good UNabridged dictionary handy as proof!